The conversion to 5e of the massive book on playable dragons clocks in at 29 pages, 1 page front cover, 1 page editorial, 1 page SRD, 2 pages of advertisement, which leaves us with 24 pages of content, so let’s take a look, shall we? Okay, so the first thing you need to know as a 5th edition player – the In the Company of…-series started off as a PFRPG-exclusive line of unusual races that codified monstrous races as balanced player options, often utilizing a class to represent progression into becoming a proper full-blown member of that race. This class was optional and thus allowed you to play the race sans progressing in it, at the cost of losing the ability-progression you’d associate with the respective monstrous entity. 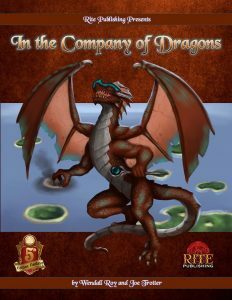 In the Company of Dragons was arguably the biggest of these books and will become even bigger soon, with an upgraded kickstarted version waiting in the wings. You have to know a couple of other things: I LOATHE the concept of playing dragons. As a person. I hate it. Seriously. Not as much as I hate Dragonlance and dragon companions, but still. I want my dragons to be the huge, big, bad bosses, the nigh-unbeatable army-squashing apex-predators. It’s a personal thing, though and, diligent review that I am, I actually reviews the original ItC:Dragons. And, picture me saying this through gritted teeth…I actually really liked it. Damn. Why? Well, the reasons for this are manifold, but at least partially are found in the superb in-game prose provided: You see, Rite Publishing’s crunch books tend to be actually good reading experiences. I know, odd, right? Kidding aside, ItC-books are written from the perspective of a member of a given race, which here would be the taninim -a kind of proto-dragon that lives in an isolated area/demiplane/suit your needs-type of locale (hence allowing easy integration into a given campaign setting), roughly aligned with Rite Publishing’s Questhaven setting that is assumed as the backdrop of all their books. Before you groan – integration into just about any setting is dead simple – no big hassle required. So yeah, by making this decision, the author managed to make dragons viable sans making wimps out of the dragons our players came to fear. Here’s the next thing, though: Beyond this interesting narrative framework, the dragons depicted herein actually also, in the PFRPG-version, had a fearsome array of power and customization options to tailor-make just about any type of dragon you wanted…and they were pretty high up on the PFRPG-power-scale. (In play, this did even somewhat out since most people will try to take down the big, nigh-impossible to overlook dragon…) Anyways, enough of a history lesson – why should you care? Well, as you may have noticed, 5e has a bit of a different design aesthetic and power-level than PFRPG: A conversion of such magnificent beasts has to walk a very thin line indeed…but does it succeed? Well, racial traits-wise, taninim get Con and Cha-increases by +1, darkvision, proficiency in in Perception and Insight and may hold weapons in your claws, but make attacks with them at disadvantage and only walk half your speed. The quadruped stature of taninim means that your slot-array is changed and they get a bite that uses Strength and deals 1d4 piercing damage…oddly sans gaining proficiency in the bite. 3 subraces are provided – truescales get +1-increases to Str and Wis and a “fly” speed of 30 feet. That should be flying speed in 5e. In a formatting glitch, Deadly Tail is written twice and nets you 1d8 (2d8 if Large or greater in size) Strength-governed bludgeoning with a range of 10 ft….as a bonus action. Not “as a bonus action when making a melee attack”. As a bonus action. Oh, and you get a wing attack that deals 10-ft.-AoE-damage to nearby foes and has the potential to knock them prone on a failed Dex save with DC being governed by Strength. Lung dragons get an increase of Strength by 2 and walking as well as climbing speed of 40 feet as well as +1 natural armor and spines that deal damage to creatures grappling the lung. Lung are proficient with their claws and deal 1d6 base damage with them. Feykin dragons increase their Dexterity by 2 and are of a tiny size, with a base walking speed of 20 ft and a fly speed of 30 feet. They gain advantage on saves versus being charmed and “cannot be put to sleep.” They also learn one sorceror-cantrip governed by Charisma. So, base-race-wise, we do have an issue here – base flying speed. Now while there already are precedents for flying races in 5e, a GM should take heed in this regard and always remember what great targets those flying PCs make… Apart from the minor hiccups mentioned, though, this iteration of the taninim can be considered a well-crafted option. The pdf also provides class options: The Scaled Juggernaut fighter gets a new fighting style, namely claws and scale – which nets proficiency with claws (base damage 1d8) and also nets you +1 AC. Claws are improved at 7th level, increasing their base damage and making them count as magical. 3rd level nets you resistance to fire and cold and adaption to extreme temperatures. 10th level provides proficiency in all saving throws and at 15th level, you can combine a Dash with a melee attack that can drop foes prone on a failed save and at 18th level, these juggernauts can make claw attacks after reducing a foe to 0 HP – as a free action. 5e usually codifies this type of behavior with bonus actions. The dread white worm, the undragon of taninim myth, also gets a new cleric domain – with generally solid spell-selections and the option to use channel divinity to consume damage you incur. Any amount of damage. God-strike of deadly annihilation? No problem…at least if you still have a channel divinity uses left. Personally, I would have prefered a scaling amount of damage absorbed here – absolute “I absorb everything”-type of abilities tend to cause issues sooner or later. 2/day, you can, at 6th level, disgorge a massive swarm of nasty grubs. Pretty awesome – at 17th level, when failing a death saving throw, you can spend your reaction to reassemble your body at full HP, at the cost of suffering “1 point of exhaustion” – which should be “level of exhaustion.” The ability can only be used 1/day – but still: Damn cool. Sorcerors may elect to become trueblood sorcerors, gaining a draconic essence (more on that later) at 1st level, but there is a chance of material components being consumed in you casting spells – and yes, this means that these sorceror have to eat the components before casting spells…which can btw. result in rather hilarious roleplaying for the more disgusting components. These sorcerors also get a breath weapon with short rest recharge that increases in potency and can be improved via “sorceror points” – which do not exist – that should be “Sorcery Points”. Higher levels increase these potencies and unlock a second draconic essence. The pdf also contains the conversion of aforementioned racial paragon class, obviously – the draconic exemplar, who gets d12 HD and no armor, weapon or tool proficiencies with saves being Str and Int and three skills chosen from Arcana, Athletics, History, Insight, Intimidation, Nature, Persuasion and Survival. The class gets no starting equipment, but begins play with proficiency in claws that scale from 1d6 to 1d12. Claws can be used as an attack action AND as a bonus action. You also get an AC of 10 + Dex-mod+Con-mod, courtesy of your scales. Your size increases at 5th level from Small to Medium, then by one step every 5 levels thereafter, with corresponding weight increase. Similarly each increases by +5 ft. at 10th level and 20th level. As a minor complaint, I think Lung taninim should probably get some replacement benefit here. Bite attacks scale up from 1d6 to 2d10 in base damage. The base class also provides a draconic gift – 3 are provided and grant abilities at 1st, 6th, 11th and 17th level. The Gift of the Behemoth allows you to regain hit points (short rest recharge) as a bonus action and renders you immune to being frightened. Personally, I think Pinion Strike needs a save – striking a foe with an opportunity attack automatically sens the creature prone to the floor…which is a bit…well. Odd. Flinging foes sans dealing damage is cool and trampling foes similarly rocks. Gift of the ancients provides elemental bonus damage to bite and claws (OUCH) as well as a shield and reflecting magic that targets you back at the caster is nasty. While this is wording-wise pretty much in line with established wording, it imho could have used a bit of clarification regarding AoE-effects for e.g. spells like fireball etc. – since 5e got rid of the “target”-line in the spell-statblock, this can otherwise be a bit problematic/cause confusion. Not a bad gripe, mind you, but one I noticed. The gift also nets you an elemental aura. The gift of the third eye provides a charming gaze that improves over the levels. On a nitpicky side, the 6th level ability’s light should probably specify the spellcasting attribute for it on a design aesthetic level, but as written, it is functional. The class also undergoes dracomorphosis, which is the name for all the aforementioned attack/size/weight-increases – with feykin dragons gaining the option to ignore them for spells based on Cha gained instead and advantage on Dexterity (Stealth)-checks. I already mentioned draconic essence – these basically determine sclae-color, damage type of your breath weapon and its shape and also offer a compulsion, basically a drawback – to e.g. have to save when trying to retreat, etc. – a total of 20 such essences are provided and allow you to tailor the chassis to generate the taninim you want to make. Aforementioned breath weapon is, fyi, unlocked at 2nd level and 3rd level provides a single alternate humanoid form so your taninim doesn’t have to wait outside the dungeon that’s too small for him. Ability score improvements work as usual and extra attacks are gained at 5th and 14th level. 7th level provides advantage on initiative rolls and 9th renders your claws magical. At 13th level, you can crush foes beneath you and at 18th, you get a terrifying roar – recharge durations for these class features make sense. The pdf provides also a significant selection of feats and while their formatting looks rather Pathfinder-ish, they still very much are products of 5e – i.e. they provide significant benefits, usually more than one…and if they provide only one benefit…well, then they at least offer one brutal benefit – take Appendage Severing. This one makes your bite crits incapacitate targets until the start of your next turn and makes them drop an item they’re holding. Similarly, size-increases for non-paragon-class taninim are cool and necessary feats like Flyby Attack are included – though here, the wording could be clearer – “If you target a creature with a melee attack, you no longer provoke opportunity attacks when you fly out of that creature’s reach.” All right. For how long? As written, one attack suffices to never provoke opportunity attacks from that target again -which is clearly not the intent. A high-level, balanced option to decapitate foes can be btw. also found here – and yes, it has legendary action, head-less etc. caveats. Editing and formatting are very good on a formal level, slightly less refined on a rules-level – while the basic rules-language is precise and to the point, there are some minor hiccups to be found here. Layout adheres to Rite Publishing’s two-column full-color standard and the pdf sports a ton of glorious dragon-artworks in full-color. The pdf comes fully bookmarked for your convenience. Wendall Roy and Joe Trotter’s conversion of this book to 5e proved to be honestly much better than I imagined it would be – the taninim as an intricate, customizable power-house have been transported well to the 5e-rules and generally are a fun race to play…but also, much like in PFRPG, a very strong race. While I’d hesitate to call it overpowered, the race itself is certainly on the strong side and honestly, when comparing lung with truescales, I think the lung got the short end of the stick. There are some components that I consider to be a bit strong, with most of them being that due to bonus actions for additional attacks not being tied to melee, allowing for a bit to much flexibility for my tastes. As for rules-language, while there are some minor Pathfinderisms herein, these do not unduly impede the functionality of the options presented herein. All in all, this is a well-crafted, if not perfect conversion of an exceedingly hard to convert book and as such, this must be called impressive. Still, with the couple of flaws noted throughout the review, I can’t award this my highest honors. Hence, my final verdict will clock in at 4.5 stars, roundd down to 4 for the purpose of this platform. You can get this massive racial book here on OBS and here on d20pfsrd.com’s shop!